Few of us have had our new hockey skates handed to us by an NHL coach. Garry Lavallee, though, is the rare exception. And not just one pair, nor two, but three. It’s all part of his lifetime love affair with hockey. Garry grew up in the Wartime housing north of Concession, developing his skills on the fields beside Alcan which were flooded in the winter into makeshift rinks. He says he had a reputation as a hardnosed player, evidently tough enough to catch the attention of the Peterborough Petes junior hockey team. From skating on the frozen fields, to playing minor professional in the hockey hotbed of Florida in the 1970s, to driving zamboni for nearly thirty years at the Wally Elmer Arena on Daly Street, Garry is a living breathing history of hockey in Kingston’s north end and beyond. Garry shared a few of his many stories during an interview in mid-July — on a day when the thought of skating was a welcome alternative to the blazing summer heat outside (his climate controlled basement helped too). One of his best tips was how to get free skates when you attend NHL training camps. In the late sixties as a junior player he attended Montreal Canadiens camp three times. Garry says that before he went for the first time, a buddy told him that if he told Canadiens staff that he’d forgotten his skates, they’d give him a brand new pair. His friend was right. Each of three years he attended, Garry would show up without skates but leave camp a few days later sporting a brand new pair of top-of-the-line CCM Tacks. For a kid from the wartime housing who had to wear his sister’s hand-me-downs at one point, the plan was brilliant. Evidently Scotty Bowman, the Habs hall-of-fame coach, caught on too. “Lavallee,” Bowman said, “this is the third year you forgot your skates.” Garry tells that story and just chuckles. “They were the ultimate skate, handed to me by Scotty Bowman,” he said. He still has that last pair, strapping on those old Tacks for a lap or two around the rink at City Hall each winter. “People look and go ‘what the hell are those? '” he says. 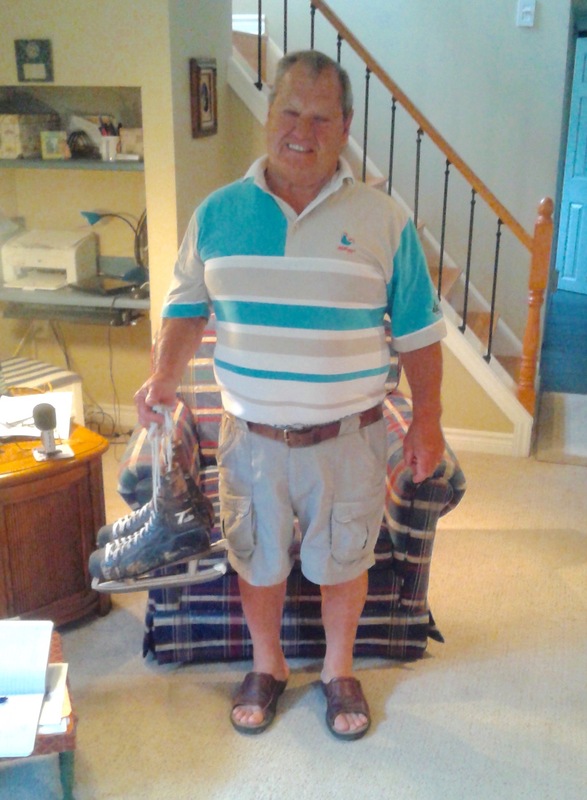 “I don’t wear socks in them, I just wear bare feet, but they still work.” So if you see Garry doing out on the ice on a crisp winter night, stop and ask him about those old blades tied to his feet, and be ready for some good local hockey lore. What a great story Gary. I really enjoyed reading about your hockey story, you were younger than I .. I was Ronnie’s age and I guess I left home before hearing about your great success in hockey, what great memories. I am in Ottawa now and enjoy this website and news from the Homefront, gotta love Kingston and the “the north end”.